Many years ago I started a simple little activity in the Library called “Word Fishing.” I set up a dictionary and wrote interesting and difficult words on cards that then reside in a glass fishbowl. Students pull a card, find the word, and then tell me a sentence of their own using the word in a way that demonstrates their understanding of its meaning. If they are correct, they can get a small sticker from a basket. It has remained one of the favorite things to do in the Library and I even have college students stop me on the street and say, “I remember that fishbowl thing! That’s how I really learned how to use a dictionary.” Fast forward to today with a lot of energy going into the Common Core Standards, especially those dealing with reading informational texts. I decided to try a variation on the word fishing and add another activity for students. I purchased some little plastic stands and made cards for each of the text features we are studying. 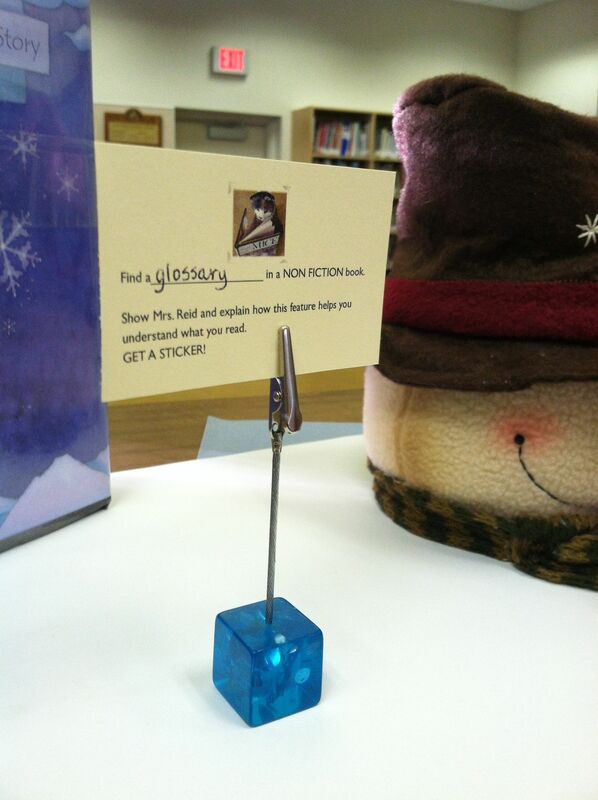 Then I tucked them around the Library. Students love finding them, finding a non fiction book to illustrate the feature, and telling me how this feature enhances their understanding of what they read. And yes, those little stickers are still very popular! What I have found is that students enjoy this informal learning task and it’s a really nice way for me to interact with them on a one on one basis. And a part of the activity they really enjoy? They get to put the little stand back in a new spot. Happy New Year! In the spirit of new and different, I have decided to change the format of this blog a little. Instead of a weekly rundown of what each class has done, I will highlight something either for the whole library program or something one particular class has done that is exciting and interesting. This might be a story and activity using Visible Thinking Routines, it might be an app we have used, it might be a student book review video from one of our Book Clubs that will be starting next week, or a combination of all those things. I might not blog each and every week. Or then again, I might blog twice in one week! I just thought it was time to mix it up a bit. I will try to include links to information about the materials if I can and you are free to adapt any of the ideas to your own library program. In that spirit, here’s a recommendation for a great app we used this week. It’s called Pocket Zoo HD ($2.99 in the App Store) and the students loved it! 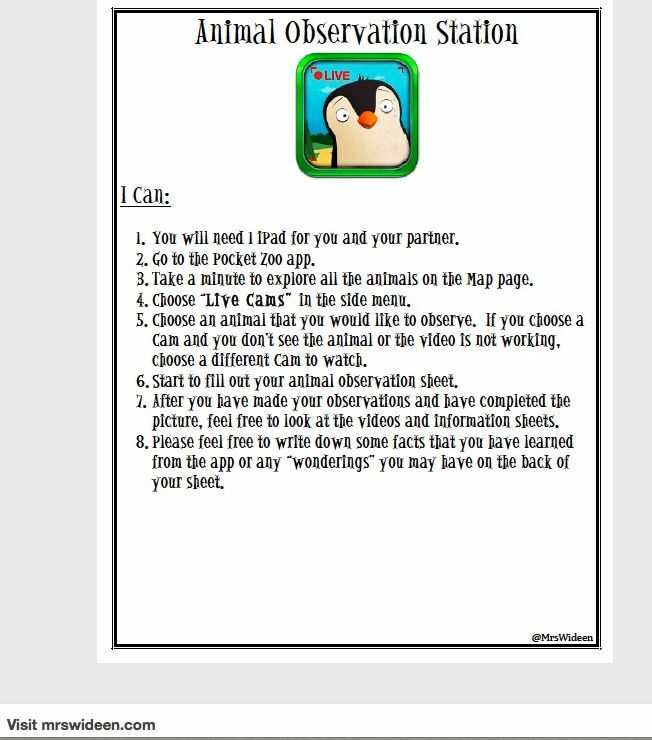 The app gives succinct information about a great variety of animals, has a collection of videos about each animal, and this is the part they were really excited about–live webcams from zoos around the globe! Some of the cameras are not of the highest quality (think security camera) but the novelty of it makes it interesting and fun. For use with our iPad minis, I found this worksheet from Mrs. Wideen’s Blog ( thank you, Mrs. Wideen!) and the students who were picked for the minis each day used that for their exploration.